Get ready for the sights, the sounds, the laughter, the fun and excitement of 90,000 square feet of Canada’s premier bus casino experience at Casino Rama. While you enjoy the excitement Can-Ar Coach Service takes care of the journey. Sit back, relax, converse with friends and enjoy the ride, as casino coach bus brings you to all the action. Bring a group or ride solo. Either way, we’ll get you there in a safe and timely fashion. Casino Rama has over 2,500 slot machines that range in theme and value – from ¢5 to $100 a turn, there’s a game for everyone. If the tables are what you crave, Casino Rama has you covered with more than 110. Bus to casino rama makes you to try your hand at Roulette, Blackjack, Big Six, Mini Baccarat and five kinds of Poker. There’s even a separate, magnificently furnished Baccarat room. Casino Rama isn’t just about gaming either. With world-class entertainment that includes legendary musicians and the hottest comedians, and a variety of dining options, from casual eats to premier fine dining, there’s plenty to enjoy at Casino Rama Toronto. With Can-Ar at the ready, you can experience it all worry free. Your choice of date, pick up location and time, and FREE deluxe motor coach transportation. 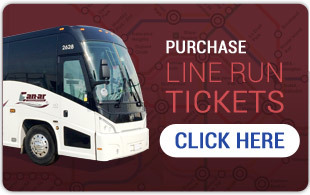 You can check casino rama bus schedule here. 1)We provide you with the Can-Ar Coach Casino Group package for FREE. 2)You organize the group and charge a per passenger rate for the trip. A Typical group organizes 45 people to go on a specific date and charges $10 per passenger for the trip. Your group earns $450 for each trip. *All bookings are based on availability and some restrictions apply. ** Programs are subject to availability, group/individual eligibility and may change without notice. Patrons must enrol in the Players Passport Club in order to be eligible for any offer compliments of Casino Rama. All patrons must be 19 years of age or older with valid government issued photo I.D.